Hello! My husband and I are thinking about getting a Vizsla! However, I do have some questions/concerns. I was wondering if there is anyone with allergies that also owns a Vizsla? I have read so many different things regarding this topic and I would really love to know how an allergy sufferer deals with it (My husband is allergic). My other question is about exercise. Realistically, how much a day would I need to exercise him without creating a complex for the dog? We are both teachers; therefore, we leave fairly early and come home around 3:30ish; however, there are days that we have to stay later. My husband is probably more active than I am--I know he would do what needs to be done. I'm just hoping I can! I'm nervous about the energy level. Do you find they are completely exhausting? Can you have any life at all? Any information would be appreciated! Thanks. first let me tell you..getting a vizsla will be the most rewarding decision you'll ever make. they are more than just beautiful and smart dogs. so, i am a fellow allergy sufferer..and although no dog breed is truly 'hypoallergenic', vizslas are almost as close as they come. i have never had ANY problems with my allergies. now the big question is about all this energy you've read about. 1st rule with any dog is exercise, exercise, exercise! with a vizsla you're going to need to spend more time exercising (whether it be off leash, or on leash) than you would with, say a yorkie...but they aren't insane. if you have a large back yard or an off leash dog park nearby, where your dog can romp around with doggy friends, this is ideal. we take our 19 month old female V to the dog park about 5 times a week for at least an hour and she's good to go. of course, i don't want to down play a vizsla's energy level! but vizslas want to have jobs and if you can exercise their minds, you'll go ALOT farther than just trying to wear them down constantly. hope this helps! As far as dogs go, V's are pretty clean. They have a single coat of hair which replaces itself constantly, so there is no real shed cycle. The hair is a little bit coarser than the hair on your arm, and about as long. Regular vacuming will be more than sufficient. The exercise issue is fairly straight forward, the more the better. Vizsla's can obtain some pretty incredible fitness levels. Mine used to be able to run for hours while I road my Mtn Bike with them. They can also be big couch potatoes too, but they're ready to go when you are. If you're worried about keeping up with them, don't, because you can't. They'll adjust to you, so no worries there. Give them room to run and they'll quarter and circle around you as you walk checking back in and going out again. If you really need to exercise your Vizsla, use a tennis racket to whack balls on a football field for the dog. Saves the wear and tear on your arm. I know people that have Vizsla's on hundred+ acre farms, and people with full time jobs that have them in apartments in Boston. The dogs and owners in both situations are happy. It can be done. They will sort of take over your life, but I find that I like to include them in as many things as possible. They're great companions and friends. I currently have two females. You'll never beat a lesson into a dog, you just beat desire out. Thank you so much for your responses! It really makes me feel better! It's definitely a big step getting a dog. I feel I need to know everything, so that I know what I am getting myself into. The information you both gave also gives me a better idea of whether we will need to get a dog walker, so I thank you for that as well. We do have a big yard (over half an acre). Would either one of you recommend getting an electric fence? We have woods in the back of our house which is all conservation land. Fortunately, for this reason, no one can build behind us, but I am sure there are animals back there that might peak the V's interest . Well, I'm getting VERY excited! Can't wait to join the ranks of the Vizsla owners! The electric fence is a good idea, and most Vizsla's figure it out very fast. It makes things a lot safer for your dog. It also makes transitioning to an e-collar easier, if you decide to go that route, for training.If you do start with a Contain and Train system. It will save you some $$ in the future by not having to have two seperate systems. Innotek makes one, IUC 5100 for example, that will easily fit your needs. A 1/2 acre is a good sized yard for a V to blow off steam in. I have about 1 acre( 2 total) e-fenced, that borders a stream and woods, and mine have a heckuva time out there. A Vizsla will dig up the ground going after moles and chipmunks. I am joining the allergy/asthma club as well and have zero problems with Nico. That's saying a lot considering he usually ends up right next to me on my pillow! For the hair issues, we have a rubber brush that we use on Nico...it helps to remove the loose hairs on him and also can be used on furniture, etc. He likes to be brushed..so I guess we're lucky there. The Vizsla is NOT a hypoallergenic dog, and they DO shed (I vacuum my house every day as well as sweep). For a list of the best breeds for allergy sufferers click here: AKC Dogs & Allergies http://www.akc.org/about/faq_allergies.cfm. An electronic fence is NOT appropriate for this breed. They are a high prey drive sporting dog and if there is something they want to chase, NOTHING will stop them. Avoid potential heartbreak and plan on appropriate fencing, which would be a 6 foot (or higher) solid fence. Well I don't suffer from allergies, but my husband does... more so with cats but he has never had a problem with our vizsla or lab for that matter. My boss used to break out from the hair rubbing his arms, but that went away too. There really is not truly hypo dog.. It may be best for you to just find a Vizsla you can spend some time with and see how it goes. That probably is your best test, so ask around and see if someone is local. Or look up breeders near you and go have a chat, which I totally suggest as well. As far as exercise... they need it, crave it, must have it if you want any peace. I did TONS of research before I chose this breed... I have been in the dog world through personal pets, then work for quite a few years... and I still questioned whether I got the right breed those first 2 years. I started out with her before I had a job, then went to a job I could bring her to (to play with other dogs even), but it was still hard. But you put your work in those first couple years and then things hit a stride. When she was a 11 week old puppy we would hike (on long line dragging) for 1-2 hours several times a week and I would say she could do more if I had let her. But it kept her happy. Add to that having 5 acres and woods near the house to go explore too. She still needed more to settle. They are not the sort of dog that will be happy with just leash walks, they need to RUN and hunt and explore. So make sure you live in an area where you can provide that. And jogging does not qualify either, sure it is better than nothing but they need to run at their own fast Vizsla pace too, not just a humans. And at DIFFERENT locations not the same one all the time. The other almost BIGGER need for them is MENTAL stimulation. They need to be taught how to relax, best way to do this is with brain engaging games/activities. Luna will come home more tired from an hour of working on agility than if I had hiked her for 3 hours. Because she was mentally exhausted/fulfilled. So you must have the time and means to engage their brains. As far as fencing, my dog can easily jump 4 feet at a standstill and she is one of the smallest Vizslas I know. So a secure fence won't hurt, and gives you peace of mine as nothing can get in to harm her either. Mine has also been trained to an invisible fence and it works beautifully for her (and the other 7 hunting dogs that live here). Luna has prey drive and a half and notices anything that moves. After she was trained to the fence she actually broke through it one day to go after a rabbit, but broke BACK through to come back to the yard. So she got herself a correction twice over a rabbit but still came back. And has never even thought of crossing since. Now she is a smart cookie, so i can't say this would be the same for any... but I know many types of dogs and breeds of dogs who hunt and don't hunt who happily can live inside an underground fence when you are home, with proper training. i still bring mine inside when I am not around as it does not keep other animals out. A word about invisible fence and then ecollar training... I find it much better to do any ecollar training before the invisible fence. We deal with a lot of training dogs who know the invisible fence and thus ecollar training can be a lot trickier... as they have learned that the stimulation means "don't go there, back up" when really if you use it to call them to you it can become counterproductive if they relate it to a fence. I trained mine to fence after the ecollar and it worked out well, but simply taking your time and working in all sorts of environments allows them to learn it's a different setup over time. But just a thought. It all comes down to knowing your dog. I say stick with your immediate fence for potty breaks and then work on some recalls so you can take advantage of the park land behind you. Most vizslas will not be happy in their yard every day anyway, so you will need to get them out anyhow. Keep asking great questions, and try and find some local breeders near you as they can be wonderful assets too. 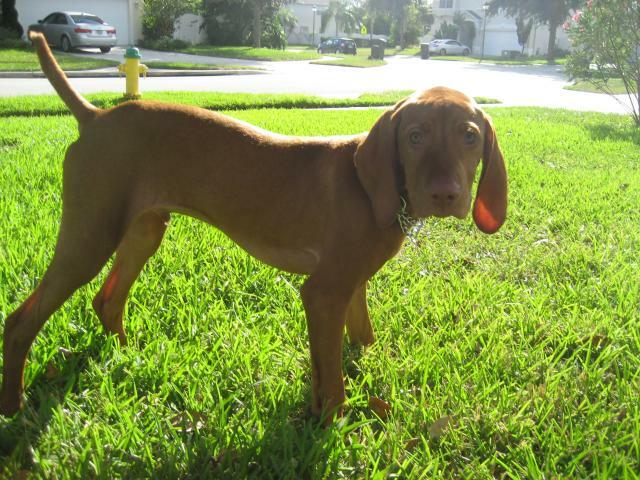 Keep in mind, IMO a good breeder will question YOU about why you want a Vizsla, not try and sell you one. Breeder should be picky, as they want to make sure their puppy is going to a good home. They need lots of exercise. with your schedule I would not recommend.